The 7 natural wonders of the world need no introduction, they’re quite simply astonishing. You cannot comprehend the scale of their beauty unless you visit them for yourself so stop what you are doing, ignore the stresses of the daily grind and be inspired to take the time out to see the 7 wonders of the natural world. The Grand Canyon is situated in the American state of Arizona and is a direct result of millions of years of geological carving by the Colorado river, it’s fair to say the result is truly breathtaking. With its geological position the Canyon is a rather hot place to go in the summer (temperatures can reach 120F), but that doesn’t seem to bother travelers with the period seeing the highest tourist numbers. We recommend you should go just before Summer, around March through to May. At this time temperatures are lower and so are the crowds, allowing you to get the best glimpse of the wonder. 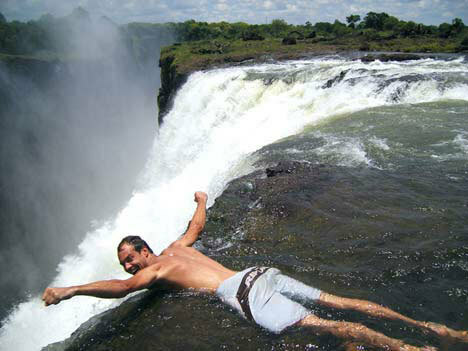 On the border of Zambia and Zimbabwe lies the largest waterfall in the world. If you’ve got the nerves you can even swim in a pool that hangs over the edge, sometimes referred to as the “Devils Pool” (see below). This is an experience like no other and you’ll have to go at the right time if you plan on taking the plunge. Locals advise that between September and December the rock barrier allows for a minimal current, i.e meaning you don’t go flying over the edge. If you don’t plan on a dip in the dangerous pool the best time to go is between Feb and May, when the rains have generated the largest volume of flow, paving the way for a truly spectacular wonder. The Great Barrier Reef is the worlds largest Coral Reef ecosystem. Situated in Queensland Australia the world heritage listed area is the only living thing on Earth that is visible from space. The most popular method of seeing the reef is to get under the water and get up close and personal with the Coral. The reef can also be seen from the air on local tours but if you’re travelling the see the wonder there really is only one way to do it, you’ll regret it if you don’t dive in! So when’s the best time to view this spectacle? We’d say either April or May. Temperatures are in the 70sF and there is little rainfall making way for great dive conditions, tourism levels are also at a medium level. The next wonder needs no introduction, if you made it to the top you’d literally be on top of the world. Of course we don’t expect you to be planning this on your trip to see the 7 wonders, but if you’ve taken a look at the video I’m sure you’ll appreciate the outstanding beauty. What we are thinking is a more inline with viewing the mountain from an ideal viewing position (Visit here for info. The best time to go for clear weather is around October/November time. However if you’re thinking of climbing the wonder you’re best getting there before the monsoon season, ideally early may. A solar wind and magnetism, that’s all you need to know as far as the science is concerned. The beauty it heralds is comprised of a flutter of multi-colored lights flickering across the sky, only visible at the poles. The best place to catch this marvel in our opinion is at the heights of the earth in the Norwegian island of Svalbard between November and February. It’s cold – be warned, but the compromise is quite frankly spectacular. The best time to visit the beautiful Rio is between December and March, assuming you’re interested in the beaches. If it’s the carnival you’re looking to view, February is the time for you. Things you must do in Rio might be obvious to the geographically savvy, but if you’re not sure what to do, ensure you don’t miss out on Sugarloaf Mountain, Christ the Redeemer and the Copacabana. The history of the Volcano is quite bizarre: In the 1940’s a farmer working in his fields noticed a loud sound coming from the ground, before a crack appeared and the earth started to spit lava. The volcano continued to erupt until it had swallowed a town and climbed to a height of over 400m. It now stands as one of the seven wonders of the natural world with tourists flocking in the thousands each year to see the marvel. Getting to the Volcano is by no means easy, as you can probably imagine. It takes over 8 hours to get there some of which is on a saddle, yes a saddle. This sounds strange but once you see the Lava flow you’ll understand why you entertained the travel, the experience is quite honestly mind-blowing.